Backend Development: programs & scripts that work behind the scenes to make web pages work right (such as forms processing, CMS* and more). We like Wordpress – the most popular CMS* in use on the Internet. Why? So you can have as little or as much control as you want. (If needed, you can opt for our one-on-one training program upon completion of your site.) We also like Joomla, Zen Cart, OpenCart, HTML5 – whatever fits best with what you want to accomplish. In other words, whatever one does should be done thoroughly. Web Design is no different. 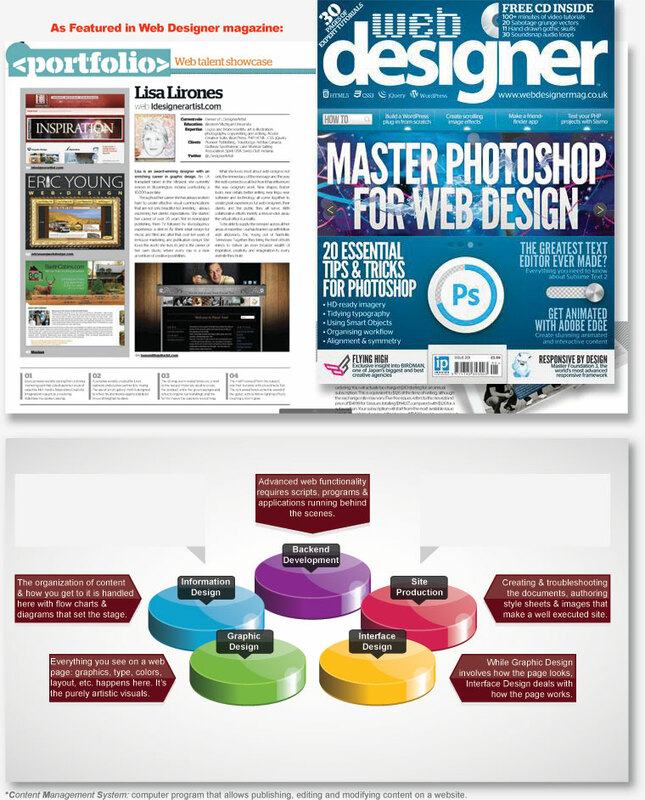 We’ve been featured in Web Designer magazine – and for good reason: We will thoroughly create your website – one with attention to every detail. At below left you’ll see just what goes into a professionally executed website – so you’ll know what to expect. Just fill out a questionnaire, provide a few essential files and we do the rest. And as with anything, you get what you pay for. It’s no different with web design. However, you won’t have to “hock the family silver” to get a site that meets your needs. Rather, get your website at a fair value and with service that is over the top. We love making your company and its products and services come to life. We are enthused about what we do. As a matter of fact, if you like the way this website works, you’ll love the one we will do for you. Contact us today with your needs. We’ll help you define that special website that’s just right for you.